Josh Bickerstaff refuels on a day that was more suited for cricket than football. EVERYONE loves it when a non-league club builds a vibrant, young team that promises much and provides an admirable example of bringing together players of potential on a modest budget. The problem is, unless the team is successful, its lifespan is very limited, for during the summer months, clubs with more money and higher status come circling like a wake of vultures waiting to pick the corpse of flesh. It’s sort of happened at Hitchin Town these past few months. Mark Burke constructed a squad that was young, energetic and full of footballing ideals. Two successive seasons of missing-out on promotion via the play-offs, no mean feat for a club that has rarely resided in the top six of any league it has played down the years, has left the Canaries’ squad a little threadbare. Hitchin’s best players have flown the nest. It started with the departure of Jonny McNamara going to Hemel Hempstead a year ago – although he returned for a cameo loan spell – and since the play-off final was lost, Matt Lench (Slough), Kane Smith (Boreham Wood), Robbie Burns (retired temporarily) and Will Wright (Colchester United Under-23) have all left the club. Some of these were on contract, but there doesn’t appear to have been any significant cash sums heading to Top Field, at least if there are such deals, they have been stamped “undisclosed”. Little wonder that the Canaries have started the season looking slightly transitional. Players like Lench and Smith, in particular, are hard to replace and given they exited with lapsed contracts, their value was never truly monetised. At one stage, people were talking in telephone numbers about the fee Smith might yield, but the transfer game is played by smart clubs that wait for contracts to expire and players to become unsettled. Smith, despite being courted by the likes of Ipswich, West Bromwich Albion and Watford, is playing in the National League with Boreham Wood – a step up, but hardly the Hawthorns or Portman Road. Hitchin failed to win any of their first four games, with the most recent results being defeats at Banbury United and Biggleswade Town. After two promotion near-misses, question marks were raised – had the team peaked?, had the team broken-up?, what was the effect of two hard-to-take setbacks in the play-offs?. There were even fanciful rumours that Mark Burke and Adam Parker, who were absent on leave from the Biggleswade game, might be heading for Hungerford Town. Anyone who knows Burke at all will be aware there is only one club he ever wants to manage. For the first time in a while, Burke and Parker face serious challenges – how to rebuild and motivate a new squad of players, and how to manage expectations after the club flew so close to the National League. They’ve brought in a gaggle of new faces, but at the moment, they need a significant acquisition to compensate for losing players like Smith and the mercurial and articulate Lench, whom I rated as Hitchin’s best player by a distance. At the moment, there’s no sign of like-for-like replacements for the club’s talented players. In their fifth game of the campaign, Hitchin played host to Royston Town, newly promoted from the Southern League Central Division. Playing clubs like Royston, Arlesey and Barton for league points has always made Hitchin feel a little uncomfortable. For decades, the Canaries were the senior club in the area and their neighbours were always considered “small fry”. But football has a habit of changing the pecking order – witness the rise of Stevenage – and Royston are effectively the “new Arlesey”, acquiring ambition as well as useful players. While Arlesey have experienced a downturn, Royston have emerged as the new pretenders, although they still lack support. Nevertheless, there were one or two Hitchin fans who found it difficult to comprehend that Royston Town are now playing in the Premier Division. It was easy to see why Royston have shifted up a gear and joined Hitchin at Step Three level. Their team is quick-moving, physical and committed. Somebody from the club admitted they had found the Premier Division “surprisingly aggressive”, but Royston looked as though they could look after themselves. 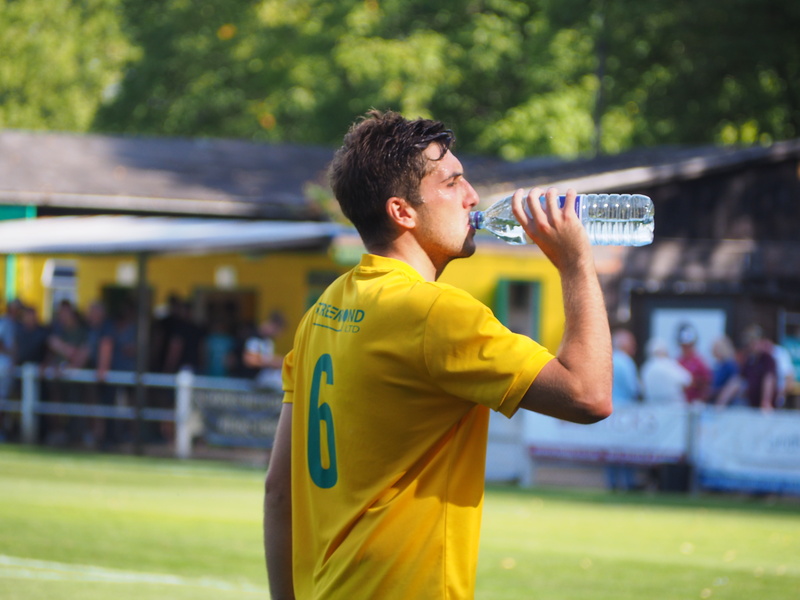 Hitchin had a couple of players who looked to be carrying excess weight and on a day when the Bank Holiday temperature hit the high 20s, it was an afternoon for sweaty brows and drink breaks. There were more than 500 people in the ground, a decent attendance for a school holiday game and signs that Hitchin have sustained the momentum in winning new fans. In the second half, Royston had plenty of possession, but the Hitchin defence held firm. Dan Webb was impressive at the heart of the backline and Johnson had an excellent game. Of the new names, Trey Charles, a 23 year-old who has taken the long route to the Hitchin first team after departing the youth set-up and playing for an assortment of clubs, looked quick and purposeful. He could be an ideal replacement for Lench. Hitchin held on to win 1-0. It was a case of function over form, but the overriding feeling was relief, the first win of the season. Their record for 2017-18 is now identical to last season, played five, won one, drawn two and lost two – and things didn’t turn out too bad in 2016-17, did they? Hitchin are indeed in transition, but they’ve been here before. When Burke and Parker took the helm in 2013, some people doubted whether they would make a success of things. Each campaign has been an improvement on the past, so don’t be surprised if a new Hitchin team is not competing at the top end of the table come the end of April. Very insightful and well researched article. But how can clubs playing at the same level as Hitchin Town sustain the wage bill that entices their best players to leave? The Canaries are based on a superb supporter base which is sustainable in the longer term, building strong foundations to match their ambitions. Other clubs are reliant on a one man money man or a small consortium of local business men savvy enough to avoid tax bills by pumping money in to a club. Upset one of them and everything tumbles like a house of cards. Absolutely. I was involved with Hitchin for 20 years on the executive committee (until 2013), so I am aware of the financial structure of the club. We tried to run the club on a sustainable basis, so it is inevitable that they will always lose their best players. Thanks for your feedback.